While you're poking around in historical archives to unearth your family history, you have a real opportunity to contribute to our understanding of an important facet of modern history. Together, we can uncover what ordinary people around the country could have known about the Holocaust from reading their local newspapers in the years 1933–1945. We need you to join our team of citizen historians uncovering new knowledge that will be shared with scholars, curators, and the public. 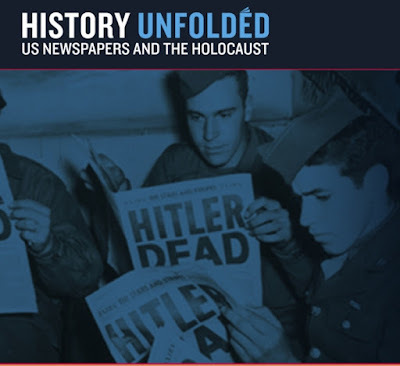 In other words, as you're digging through old newspapers from the 1930s and 1940s to find tidbits of family history, you can also be on the lookout for stories about Hitler, Nazis, the treatment of the Jews and the reactions here in America. Find an article, clip it (literally or digitally) and send it the museum to be added to their collection. All submissions become part of the collection of the Holocaust Museum and will be available online for all to see. This is an unusual and valuable opportunity to contribute to the historical record. Let us know in the comments below what you've discovered.